Sebastian Langrock Wins Event 64! In just 156 hands on the official final table, Sebastian Langrock is the latest World Series of Poker bracelet winner after taking down Event #64: $1,500 No-Limit Hold'em/Pot-Limit Omaha 8-Handed Mix for $268,555. Langrock defeated a worthy opponent in WSOP bracelet winner Ryan Laplante, eliminating him in 22 hands once heads-up play began. In the final hand playing pot-limit omaha, Langrock flopped the nut straight and Laplante flopped a flush and straight draw and the two players got it all in on the flop. The board bricked out and Laplante had to settle for a runner-up finish worth $165,983. Laplante was definitely a formidable opponent, looking to follow up his first bracelet from the 2016 Event #12: $565 Pot-Limit Omaha for his biggest career cash for $190,328. His cash today puts his live earnings over $1.4 million, making this is fifth WSOP cash of the summer. This mixed event attracted a total of 1,056 entries by the time registration closed on Day 1, and 159 players would eventually be guaranteed to make the money. 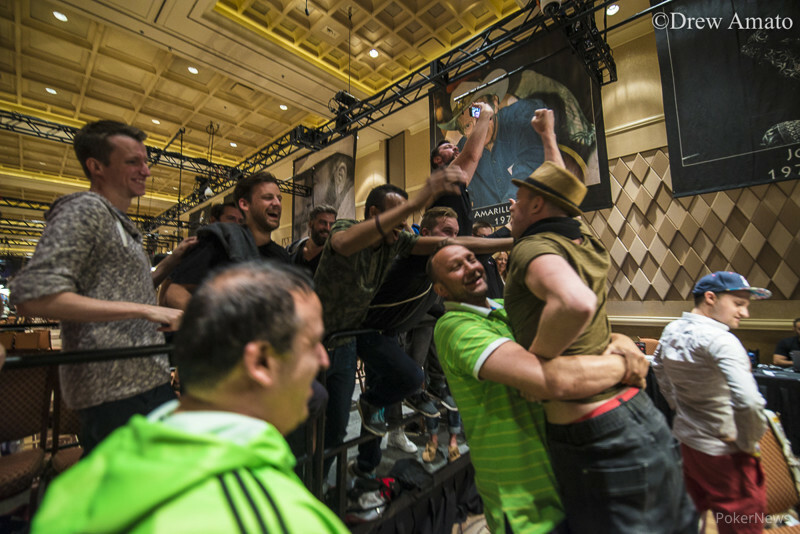 The money bubble burst in the last hand of the night on Day 1, sending 158 players on to Day 2. 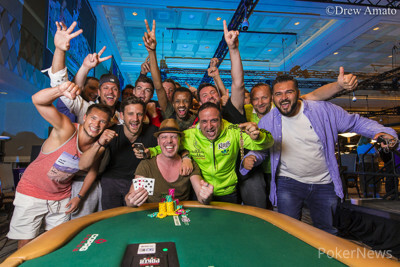 Langrock is a professional poker player from Austria with over $600,000 in lifetime earnings after this win. He has been coming to the WSOP for five consecutive years now, and has been specializing in pot-limit Omaha for the last two years. Langrock is actually known for winning 'Who Wants to be a Millionaire' in Germany in 2013, and talked about how he was able to pursue a living in poker after winning that game show. The turning point for Langrock was when he called Fernando Brito's all in while he was short and flipped with king-queen against Brito's fives. "Actually, I think it was the wrong call, but I had the feeling that if I want to win it, I have to go with it this time because if I fold, I’m down to seven bigs and I have no chance at all. So, I called and win the flip and then I could spin it up. I was focusing on the PLO hands and the winning hand was in PLO, so it worked out", explained Langrock. Langrock plans to play the Main Event, as he always has, but almost went home before this event. "Actually, I was planning on going home like a week ago. I was here for three weeks but then I was like, I’m not that Vegas-tired like I was the years before after three weeks. So I decided spontaneously to extend my stay, and that worked out pretty f***ng well." Some of the familiar faces to make it in the money in this event include Connor Drinan (12th place - $15,749), Chris Moorman (17th place - $8,137), Juha Helppi (28th place - $6,718), Bryce Yockey (39th place - $5,628), Matt Affleck (48th place - $4,785), Jeff Gross (72nd place - $3,222), Barny Boatman (99th place - $2,501), Carlos Mortensen (126th place - $2,374), and defending champion Loren Klein (137th place - $2,293). Only 159 players could make the money, meaning a ton of notables took shots but couldn't make it work, including Andy Spears, Jessica Dawley, Ismael Bojang, Owais Ahmed, Ari Engel, Mike Leah, Yevgeniy Timoshenko, Upeshka De Silva, Kenny Hallaert, David Peters, Barry Greenstein, Men Nguyen, Kristen Bicknell, and Maria Ho. The unofficial final table of nine came together after the elimination of Mark Radoja in 10th place ($20,181). He flopped bottom set playing pot-limit Omaha and got it all in with Taylor who held the nut flush draw. She hit it on the turn, and Radoja was unable to fill up for a shot at his third career WSOP bracelet. The official final table began just 20 short minutes later once Jagdeep Singh's run ended in ninth place. Singh also took home $20,181 after his set of kings couldn't hold against Shorr who made himself a straight on the river. Players moved from Miranda to Amazon Gold for the official final table of eight, and it would take 26 hands before Fernando Brito found himself at the payout desk in eighth place. He moved in with his short stack holding pocket fives and found himself flipping with Langrock with king-queen. The flop came king-high and Brito would have to settle for $26,216 for his deep run today. Frenchman Victor Choupeaux was very short but found himself a stack to work with as he doubled up in pot-limit Omaha with queens, up against Laplante's jacks. Zahir Gilani and Jerry Callahan took turns doubling up their short stacks, while Langrock slowly chipped up as well. It was almost 50 hands later until another player hit the rail, and it was Callahan who fell in seventh place ($34,515). Langrock defended his big blind following a raise from Callahan and saw a turn after he flopped bottom pair. The turn gave Langrock two pair and Callahan committed himself with two queens for an over pair to the board. The river bricked out and Callahan said his goodbyes. In the very next hand, Zahir Gilani got his short stack in the middle with kings in the big blind playing pot-limit Omaha, but he ran into Langrock's aces in the small blind and couldn't improve. The Canadian pocketed $46,048 for his sixth place finish in his first-ever WSOP event. 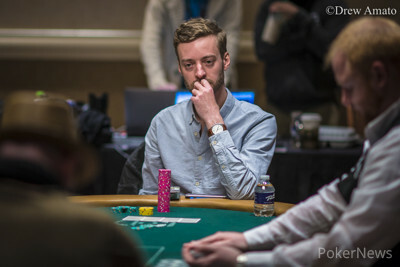 The final five went on a dinner break, and Langrock held almost half of the chips in play. In just the fourth hand back from dinner, Shannon Shorr got the last of his chips in the middle with king-jack but ran into Victor Choupeaux's ace-jack and settled for fifth place and a payout worth $62,242. Shorr was unable to capture his first bracelet, but he impressively came back from less than one big blind on Day 2 to make a deep run today. He was down to just 3,500 when blinds were at 2,000/4,000 and spun his stack up to 270,000 in just ten hands. He found a bag to make it to the final 16 on Day 3, and navigated his way to a decent score. Play remained extremely tight for the next 20 hands, and eventually Esther 'Etay' Taylor moved in with pocket threes and found herself flipping with Laplante who held ace-queen. The flop came queen-high and Taylor made her way to the rail full of 'Etay' fans who were supporting her from the very start of the day. Taylor pocketed $85,225 for fourth place for her deep run today. Three-handed play lasted about 30 hands, but it was eventually France's Choupeaux who fell in third place ($118,190). He found himself short and eventually got it in with king-nine off suit and couldn't catch up to Langrock's ace-five of spades. Choupeaux made a massive comeback after being the shortest stack for a good while, but had the support of his loud French rail the entire time. Heads-up play didn't last very long, and it was only fitting that Langrock would win the tournament after flopping the nut straight to seal the deal. As always, we appreciate you following along as the PokerNews reporting team brings you all of the action in yet another bracelet event! 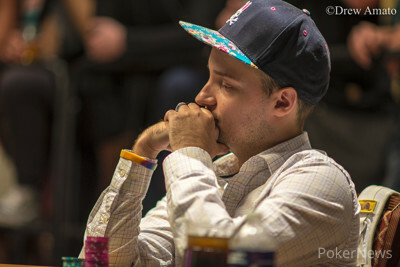 Hand #156: Sebastian Langrock raised to 135,000 and Ryan Laplante called. The flop came and Laplante checked. Langrock bet 160,000 and Laplante check-raised to 750,000. Langrock looked to see how much Laplante had behind and re-raised the pot, putting Laplante to the test for the rest of his chips. Laplante quickly called. Laplante was at risk with for a flush draw along with a straight draw, up against Langhorn's for the nut straight. The turn was the and the river was the , sending Laplante to the rail in second place for a payout worth $165,983. Hand #154: Ryan Laplante got a walk. Hand #155: Laplante limped in and Sebastian Langrock checked his option. The flop came , Langrock checked, Laplante bet 70,000 and Langrock folded. Hand #146: Sebastian Langrock raised to 130,000 on the button and Ryan Laplante called in the big blind. They both checked the flop and the turn, and Laplante bet 160,000 on the river. Langrock folded and Laplante took the pot. Hand #147: Laplante raised to 125,000 on the button and Langrock called in the big blind. The flop came and Laplante bet 85,000. Langrock folded and Laplante won the pot. Hand #148: Langrock raised to 130,000 on the button and Laplante folded his big blind. Hand #149: Laplante raised to 125,000 on the button and Langrock three-bet to 400,000. Laplante folded and Langrock won the pot. Hand #150: Laplante got a walk. Hand #151: Laplante raised to 125,000 on the button and Langrock folded his big blind. Hand #152: Langrock completed on the button and Laplante checked his option. The flop came and both players checked. The turn was the and Laplante checked. Langrock bet 75,000 and Laplante folded. Hand #153: Laplante completed on the button and Langrock checked his option. The flop was and Langrock bet 60,000. Laplante called and they checked the turn and the river. Langrock said "Ace-queen," and Laplante showed for jacks and nines to win the pot. Hand #140: Sebastian Langrock raised to 150,000 on the button and Ryan Laplante called. The flop came and both players checked to the on the turn and the on the river. Laplante checked, and Langrock bet 200,000. Laplante tank-called. Langrock tabled for trip nines and raked in the pot. Hand #141: Laplante raised to 125,000 on the button and Langrock called. The flop came and both players checked to the on the turn. Langrock bet 125,000 and Laplante called. The river was the and both players checked. Langrock tabled and Laplante mucked. Hand #142: Langrock called on the button and Laplante checked his option. The flop came , Laplante bet 85,000 and Langrock mucked. Hand #143: Laplante raised to 125,000 on the button and Langrock called. The flop came and Langrock check-folded to a bet of 175,000 from Laplante. Hand #144: Langrock limped in on the button and Laplante checked his option. The flop came and both players checked to the on the turn. Laplante bet 65,000 and Langrock called. The river was the and Laplante check-folded to a bet of 180,000 from Langrock. Hand #145: Laplante raised to 125,000 on the button and Langrock called. The flop came and Langrock check-called a bet of 110,000 from Laplante. The turn was the and Langrock check-called a bet of 275,000 from Laplante this time. The river was the and both players checked. Langrock confidently tabled for two pair kings and tens with a nine kicker and Laplante showed for a worse kicker. Hand #135: Langrock got a walk. Hand #136: Langrock raised to 125,000 on the button and Laplante called in the big blind. They both checked the flop, and the turn was the . Laplante bet 150,000 and Langrock called. The river was the and Laplante checked. Langrock bet 100,000 and Laplante raised to 700,000. After a long pause, Langrock made it 1,900,000. Laplante had a wry smile on his face and sent his hand to the muck. Hand #137: Laplante completed on the button and Langrock checked in the big blind. They both checked the flop and the turn. The river was the and Langrock checked. Laplante bet 75,000, Langrock raised to 200,000, and Laplante made it 575,000. "There we go," Langrock said, and he folded his hand. Hand #138: Langrock completed on the button and Laplante checked in the big blind. The flop came and Laplante checked. Langrock bet 100,000 and Laplante folded. Hand #139: Laplante raised to 125,000 on the button and Langrock folded. Ryan Laplante and Sebastian Langrock are now heads-up for the title in Amazon Gold! Langrock has a slight edge with 4,095,000 to Laplante's 3,850,000 chips. Laplante is in the hunt for bracelet number two! Hand #133: Victor Choupeaux moved all in from the small blind and got no action. Hand #134: Choupeaux moved all in for 705,000 on the button and sebastian Langrock called from the small blind. Choupeaux was at risk with , while Langrock held , slightly in the lead. The board ran out and Langrock straightened out to eliminate the Frenchman in third place for $118,190. Hand #125: Sebastian Langrock completed in the small blind and Ryan Laplante checked his option. The flop came and Langrock bet 80,000. Laplante folded and Langrock won the pot. Hand #126: Laplante completed in the small blind and Victor Choupeaux checked in the big blind. The flop was and Laplante bet 70,000. Choupeaux folded. Hand #127: Choupeaux completed in the small blind and Langrock raised to 180,000 in the big blind. They both checked the flop and the turn was the . Choupeaux bet 170,000 and Langrock folded. Hand #128: Laplante got a walk in the big blind. Hand #129: Laplante went all in from the small blind and Choupeaux folded his big blind. Hand #130: Laplante limped on the button and Langrock checked his big blind and the flop came . Langrock checked, Laplante bet 75,000, and Langrock folded. Hand #131: Laplante got a walk. Hand #132: Langrock raised to 125,000 on the button, Laplante called in the small blind, and Choupeaux called in the big blind. The flop was and they both checked. On the turn, Laplante bet 325,000. Choupeaux and Langrock both folded and Laplante took the pot.